Bug module in SuiteCRM is used to track and manage product-related problems, commonly referred to as bugs, defects, or feature requests, either found internally or reported by customers. Default installation include Bug module, but hidden and hence not appear in module list. To appear in module list, remove from the hidden module setting. To do this, login as CRM admin page and go to 'Display Modules and Subpanels'. How to include full email history in saving reply email? When replying an email, Gmail hide conversation history by '...' element at the bottom of the message. Clicking them cause to show full conversation history. Only then, archived email will have full conversation history. Is it possible to automatically archive all incoming email? How to check I have a license? There are two types of license. For standard license check in 'About' panel. For site license check in Sugar setting. How to refresh Sugar metadata? Yathit use Sugar Metadata for available fields in the module, labels, relationships, access right, etc to display panel. These metadata are rarely change and hence Yathit cache the data for long. Sugar metadata can be update immediately in the Sugar setting panel. Is Yathit compatible with my VPN? Yathit is compatible with a Virtual Private Network (VPN) provided it allows a connection to www.yathit.com. Click the trash can icon an extension from Chrome by the extension you'd like to completely remove. Chrome extension are automatically updated and hence manual updating is not required. Auto update take about few hours to a day from the new version release. Closing and re-launching Chrome browser may update the extension automatically. Disable and re-enable the extension from Chrome Extension page (chrome://extensions) may reset or update the extension. Current version number can be found in Chrome Web Store. Check your extension version in About panel (below). How to uninstall Yathit InboxCRM? See the uninstall section in the uninstallation page. Yes, this extension is consistently tested against all new releases of SuiteCRM, including the latest 7.9.4. Which versions of SugarCRM are supported? We support SugarCRM versions from 4.5 to the latest version. All editions of SugarCRM, including community edition, are supported. Does synchronization support Google calendar and tasks? How to Switch to another CRM Account? To switch to another CRM account, please visit your Sugar Setting Panel , and remove the existing SugarCRM instance and then add a login with the new CRM account. Can I buy Yathit InboxCRM for my entire company? Yes, you can buy multiple licenses and apply them your entire company. What will happen to my data if I install Yathit InboxCRM? 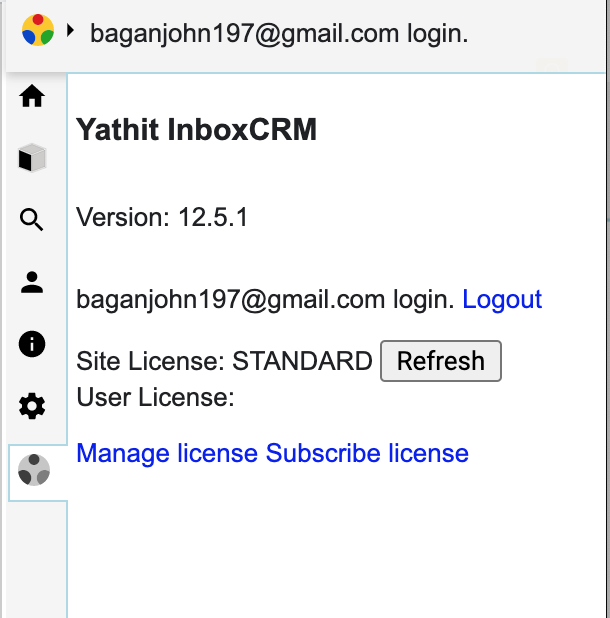 Yathit InboxCRM does not make any change to your data on SugarCRM or Gmail. We do not store your CRM and Gmail data on our server. Any change made from the extension is directly submitted to your SugarCRM server or Google server. Currently, the extension is only available on the desktop Chrome web browser (Recommended) and Opera web browser. It is available in Windows, OS X, and Linux operating system. Experimental support for Firefox addon is also available. Can I use Yathit InboxCRM on multiple computers? We support multiple browsers, licensing is based on your sugar account or Yathit account and not a device. How secure is your Extension? Security is very important for us and our clients both; hence, we have taken all necessary measures to ensure the highest security from the ground up. All connections are made using an SSL connection encrypted with modern cryptography. We use secure Google cloud services for authentication and data storage. We do not store your user name and password on our server. What you do with the SugarCRM credentials and how they remain safe? The SugarCRM credential i.e. user name and hash password are stored in the browser localStorage. The credentials are used to authenticate your SugarCRM server. Your SugarCRM credentials remain within your browser, and are never sent to any server, including our Yathit login server. Moreover, to prevent casual inspection of the credentials, they are encrypted with RC4 cipher with SHA1 hash and salt. Do you have "Do Not Track" feature in email tracking? Yes, we have the "Do Not Track" feature in email tracking. This feature ensures that the users' information is not collected explicitly even after the tracked email has been sent. However, unlike browser, the "Do Not Track" signal needs to be set manually. See Do Not Track Setting for how to turn on.